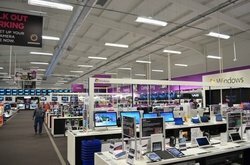 A fragile economy, lack of football world cup to spur TV sales and a gap between iPad launches all took their toll on Dixons Retail operation with sales dropping at the high-street giant. Long seen as one of the main barometers of how the consumer tech sector is faring the latest numbers, for the three months ended 23 July, come as rivals as also struggling with Comet's owners looking at strategic options and Best Buy UK not having quite the impact the US owners had originally hoped for. Like-for-like sales in the first fiscal quarter fell by 7% year-on-year with the levels in the UK and Ireland dropping by 10%. Those declines were not universal and the Nordics saw tills ringing with a 4% increase. The worst performing area of the business from a sales perspective was in the pure play e-commerce area, which saw like-for-like sales slump by 16%. John Browett, chief executive at Dixons Retail, remained upbeat pointing out that the UK had performed in line with expectations and it had managed to make even further savings in its cost cutting programme finding an extra £10m to add to the £50m it already planned to shave off this financial year but the retailer continues to spend on its store refresh with plans to spend £100m this year doing up its stores to attract in more customers. "This performance was in line with our expectations when compared with particularly strong trading last year as a result of the World Cup and launch of the iPad. While underlying market conditions have remained challenging this year we have continued to trade ahead of our markets as customers respond to our improving customer offer," said Browett. "While we remain cautious about the economic outlook we will continue to deliver on our renewal and transformation plan and make the business better, easier and cheaper to run and deliver an unbeatable combination of Value, Choice and Service for customers," he added.